2009 has already been a banner year for the number "44" in our corner of Chicagoland. While local boy Barack Obama's ascent to become our nation's 44th president doesn't exactly bring us joy, nor does the fact that the Chicago Bears are already looking forward to Super Bowl 44 since they've blown a bid for this season's Super Bowl XLIII, being awarded the "Murph 44" license plate from my beloved mother-in-law Genevieve "Murph" Ohlin's estate (44 S. Third St. was Murph's address for three fourth's of her 87 years) more than makes up for it. 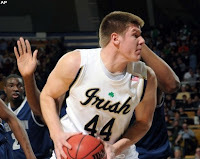 Still, nowhere in the nation was the number 44 more important last night than at Notre Dame, where Irish star (and jersey #44) Luke Harangody scored 31 points to lead 13th ranked Irish to their 44th straight home win, a down-to-the-wire 73-67 decision over the 10th ranked Georgetown Hoyas. Going into this game, the Irish knew that Brigham Young's loss last week meant Notre Dame now owned the longest current home court winning streak in college basketball. Still, protecting it would be no cakewalk. Notre Dame was itself coming off a five point upset loss at St. John's over the weekend, and the always tough Hoyas had taken their last five games against its Irish rivals. But none of those games had taken place in South Bend, and when the Irish, behind Harangody's nineteen first half points, jumped out in front by eleven at the intermission, the townies (who were supplying the joyful noise at the Joyce Center last night in place of the on-break student body) began to breathe easier. But easy this win was not. First, the Hoyas went on a 7-0 run early in the second half to draw within four. Then, with 15:41 still left in the contest, Harangody picked up his fourth foul on a questionable charging call, and the Irish star had to come out. But rather than sit big Luke for an extended period of time, Irish coach, Mike Brey, gambled that #44 would be smart enough to play the rest of the game without picking up his fifth foul, and inserted Harangody back in the lineup less than four minutes later. Not only did the move pay off, as Harangody stayed (and starred) in the contest to its conclusion, but aided by two clutch three-pointers by Kyle McAlarney (17 pts. including 5 "threes"), and some nearly flawless free throwing (the Irish finished 15 of 16 from the line), the Domers hung on at home again. "He's the MVP of our league," Georgetown coach, John Thompson III, said about Harangody after the game, adding, "He makes good decisions and can score from many places on the court." Meanwhile, Coach Brey, while acknowledging Luke's enormous contributions, instead paid homage to an even bigger source of strength. "They really believe in this building ... Notre Dame is a great advantage for us ... we know we can always come home and get well." The Irish go back on the brutal Big East road (where a record nine league teams are ranked) later this week, but before they do, let them first celebrate today's feast of one of their own (Blessed Andre Bessette of the Holy Cross Order) then pray for the grace so that #44 and the boys can carry the courage of the Notre Dame name with them.